In addition to the standard tokens (see Tokens and mail merge in Common workflows for a full explanation of tokens) that are available in CiviMail, messages sent via scheduled reminders can also contain tokens representing information about events, activities and memberships that the scheduled reminder pertains to. 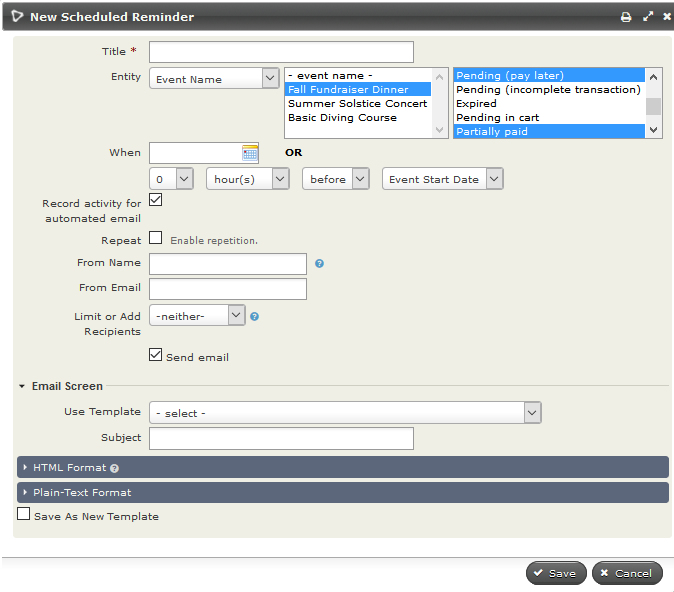 This allows you to use one scheduled reminder template for various events, membership or activity types. Select the required Entity. The options you can base your scheduled reminder on will be displayed in the adjacent window. This is a multi-select field, so you could choose to include more than one option in this field. Depending or your selection in this middle field a third set of option will appear in the right box. Again this is usually a multi-select field. Choose to send your reminder as an email, an SMS or either depending on the preferred method(s) of communications for the contact. NOTE: The SMS options will only be available if you have set up an SMS gateway. IMPORTANT: Your system administrator will need to ensure that the Send Scheduled Reminders scheduled job is enabled and runs at least once a day. Refer to the Scheduled Jobs chapter for configuration details. sending to contacts associated with any combination of core and custom activity types. Note: If a member renews, they will receive their next reminder 5 days before their new Membership End Date.